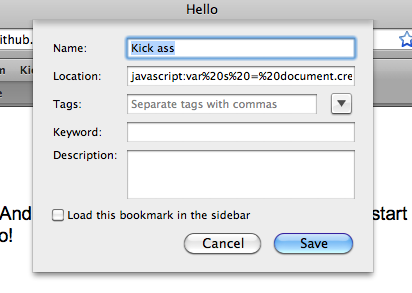 Drag this bookmarklet to your bookmarks bar or a tab and start having some fun on other pages too! Tip: It works great for vaporizing annoying ads. Try it out! Remember: It's cooler if you make your own sound effects. My name is Erik Rothoff Andersson. I am 18 years of age and currently live in Sweden. I have a company with my brother: Rootof Creations. We're a digital production company. If you have any creative ideas that need to be coded (or designed), we'd love to help. Or if you feel like talking to me: erik.rothoff@gmail.com. Do you want this, or something similar, on your site? Let's talk! Please check the source at github.com/erkie/erkie.github.com.